Over the past year, I have been a regular at a local gym, lifting and stretching as part of an overall effort to get fit and stay fit into my sixties. The biggest immediate benefits I have experienced are weight loss and (knock on wood) the almost complete disappearance of my lower back issues. On the golf end of things, I have significantly increased my distance with every club. My regular playing partner has noticed and hitting the weights has made a difference. I have religiously worked out three times a week for more than a year (actually more like five, since I walk and stretch on off-days) — religiously, that is, except when I have been travelling. When on the road, I feel as though I am losing some of the momentum I have built. One solution I found was resistance bands. Another that I will try is the body weight only workout recommended by Darebee. 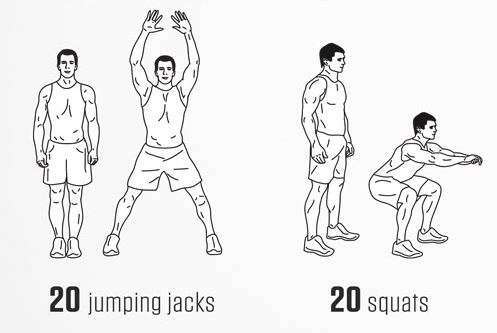 It consists of six exercises that you can do without equipment and likely with take only 15 to 20 minutes. My only reservation is that I don’t like push-ups. They make my elbows click uncomfortably.